Keystone arches, bay windows, and a stone and stucco veneer with copper roofing give this home a classic, old world appeal with a plan for today's lifestyle. A fireplace nestled between built-in bookshelves warms a two-story family room, while a second fireplace brings warmth to a study/living room with cathedral ceiling. 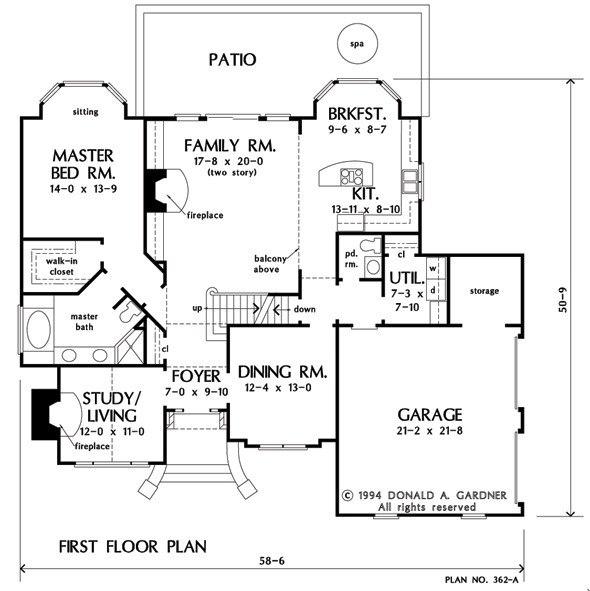 The first floor features nine foot ceilings throughout. The master suite, secluded on the first floor, is a private haven offering a luxurious bath, walk-in closet, and sitting bay. 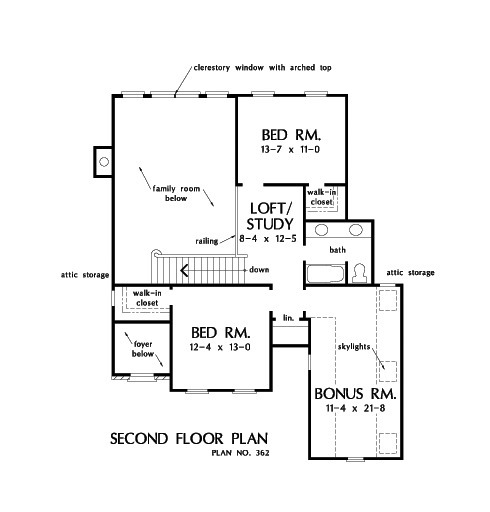 Upstairs, a loft/study overlooks the family room and separates the two bedrooms, both with walk-in closets. The skylit bonus room is accessed from the second floor. 1st Floor: 1715 Sq. Ft. Bonus Room: 265 Sq. 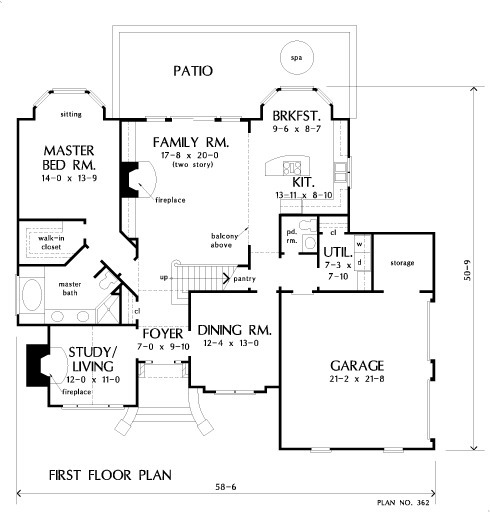 Ft.
House Dimensions: 58' 6" x 50' 9"
Foyer (Vaulted): 7' 0" x 9' 10" x 18' 1"
Dining Room : 12' 4" x 13' 0" x 9' 0"
Great Room (2 Story): 17' 8" x 20' 0" x 18' 1"
Kitchen : 13' 11" x 8' 10" x 9' 0"
Breakfast Room : 9' 6" x 8' 7" x 9' 0"
Utility Room : 7' 3" x 7' 10" x 9' 0"
Bonus Room (Vaulted): 11' 4" x 21' 8" x 8' 2"
Garage : 21' 2" x 21' 8" x 0' 0"
Garage Storage : 8' 3" x 7' 10" x 0' 0"
Bedroom #2 : 12' 4" x 13' 0" x 8' 0"
Bedroom #3 : 13' 7" x 11' 0" x 8' 0"
Porch - Front : 7' 0" x 6' 0" x 0' 0"
Deck / Patio : 32' 3" x 12' 0" x 0' 0"
Loft / Study : 8' 4" x 12' 5" x 8' 0"
Living Room (Vaulted): 12' 0" x 11' 0" x 16' 0"
Other : 9' 6" x 3' 10" x 9' 0"